Kinetic. When dry ice pellets are accelerated in a jet of compressed air and strike a surface at the speed of sound, they crack and loosen the coating on the surface being treated. Thermal. The low temperature of the dry ice pellets (-79oC/110oF) makes the coating brittle, crack and loosens it. This allows the dry ice to permeate the coating. Sublimation. Dry ice penetrates the coating and immediately sublimes (passes direct from solid to vapour state). This results in a 700-fold increase in volume; an explosive effect that lifts the coating off the surface. Dry ice blasting is also referred to as dry ice cleaning, CO2 blasting or cryogenic blasting. It is non-toxic, non-conductive and non-abrasive. Dry ice vaporises immediately on contact with treated surfaces which gives unique advantages in comparison with traditional blasting methods. With dry ice blasting there is no secondary waste material (for example sand, glass or plastic). The only waste to be swept or vacuumed up is the coating dislodged by the treatment. It is therefore possible to clean objects in which other blasting methods' residual blasting material would collect in every inaccessible corner. Dry ice blasting allows cleaning to be performed while machines are running, without the need for dismantling. It is an environmentally and equipment friendly alternative to conventional cleaning methods and can add value to your business through improved productivity, reduced waste and lower costs. How does Polar ICS compare to your current cleaning process? 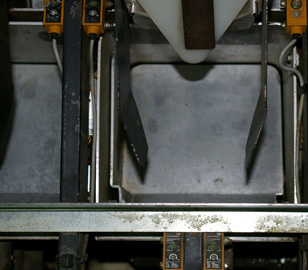 Images are of the weighing units belonging to a Sorma Verti-Pack automatic weighing machine being used to pack primarily citrus. The units are positioned on the top of the machine and by design are difficult to access. The machine had a very high build up of general dirt, wax from the fruit and plu labels. With the use of an extended lance it was possible to access them in situ and successfully clean each unit. Conventional cleaning methods could not be used in this area of the machine due to the electronic weighing mechanisms that are in place and their sensitivity to moisture. 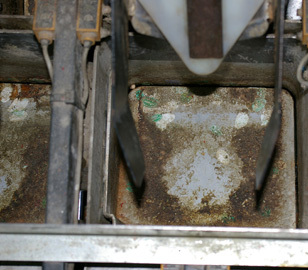 The entire machine was thoroughly cleaned and ready to work again within 2.5 hours.